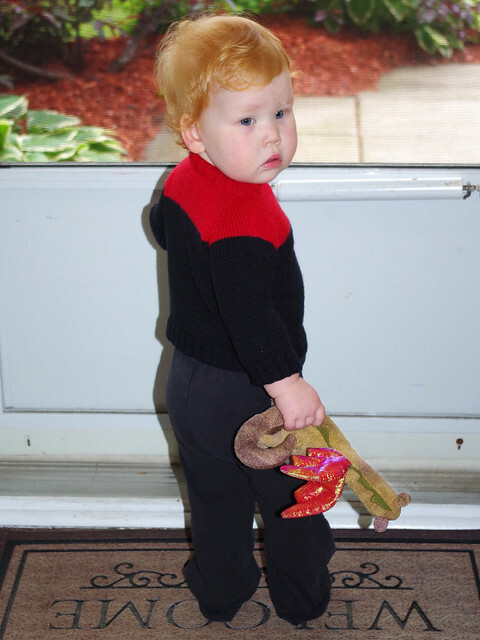 As this week is the lead-up to ComicCon, I thought it appropriate that I re-post my pattern from my old blog for a Star-Trek-inspired baby sweater. Back in June of 2013, friends of mine were expecting their first child at any time, so I wanted to knit them an appropriately-geeky baby gift. The couple was particularly fond of Star Trek, specifically The Next Generation (TNG) and Deep Space Nine (DS9). I knew what I wanted to knit, but I couldn’t find an appropriate pattern online, so I had to come up with one myself. We didn’t know if the baby would be a boy or a girl, so I thought that a sweater based on a uniform would be most appropriate. Most notably, I used photos of Kate Mulgrew as Captain Kathryn Janeway and Avery Brooks as Captain Benjamin Sisko as references. Sweater modeled by Thing 2, who was 18 months old at the time, and who comfortably wore a size 2. The sweater is a bit too short in the arms and body, as well as being snug. I would say it’s actually about a 12-18 month size, but as you can see, it does have some stretch. I used Fringe Association’s tutorial for how to improvise a top-down sweater — which is full of invaluable information — as a basis for my pattern. I really needed the help, especially since at the time I’d only ever knit two other baby sweaters, and that was years prior. I had some difficulties with getting the sizing right, to start. The first two tries were disasters, the first yielding a neck that wouldn’t fit a preemie, and the second one that was too big for my four-and-a-half-year-old. Try three gave me the size I wanted: 12-18 months, with a nice stretchy neck and short collar to accommodate a baby’s big head and short neck. – Using the cherry yarn and the stretchiest cast on you know, cast on 80 stitches. Tillybuddy’s Very Stretchy Cast-On for Double and Single Ribbing is the best cast-on I’ve found for this. – Divide the stitches so that there are 40 stitches on each needle. – Being careful not to twist, join for working in the round. – Work in K2, P2 ribbing for 2.5cm (1″). – Additionally, add a different coloured stitch marker at the end of each row. – Round 1: Knit until last stitch before first marker, KFB, knit until first stitch after second marker, KFB, knit until last stitch before third marker, KFB, knit until first stitch after fourth marker, KFB, knit to end of needle. Repeat for second needle. – Round 2: Knit. This pattern will increase the number of stitches on each needle by four every two rounds. – Repeat Round 1 and Round 2 until the sweater measures 9cm (3.5″) from the very start of the neck. Switch the yarn to black yarn in the middle of the back of the next Round 2. – Knit until you reach the first marker, remove the marker, and then knit one more stitch. Place a marker. Remove the next marker. – Knit until you reach the next marker, remove the marker, and then knit one more stitch. – Cast on 4 stitches, place a marker, cast on another 4 stitches. – Knit until you reach the next stitch marker. Remove the marker, the knit one more stitch. – Your stitch count should be as follows: 44 stitches on each piece of waste yarn for the sleeves, and 72 stitches on each side of what will now be the body. – Knit until the piece measures 27cm (10.5″) from the very top of the neck. – Work in K2, P2 rib for an additional 2.5cm (1″). – Cast off loosely, but not too loosely. I like Jeny’s Surprisingly Stretchy Bind Off, but to keep the rib from flaring I only used it on the purl stitches, and I did a straight cast off on the knit stitches. – *Pick up the 44 stitches that were set aside for one sleeve on waste yarn, then divide them in half, putting half on each needle. Put a stitch marker between the halves. – Pick up and knit 8 stitches in the armpit of the sleeve (where you cast on the extra 8 stitches for the body earlier). – Place a marker halfway. This should yield you 52 stitches total (26 on each needle) on the sleeve. – Knit the sleeve in the round until it reaches 14cm (5.5″) measured from the armpit. – At the start and end of each needle, K2tog for one round. You should now have 48 stitches total (24 on each needle). – Repeat from * to ** for the second sleeve. 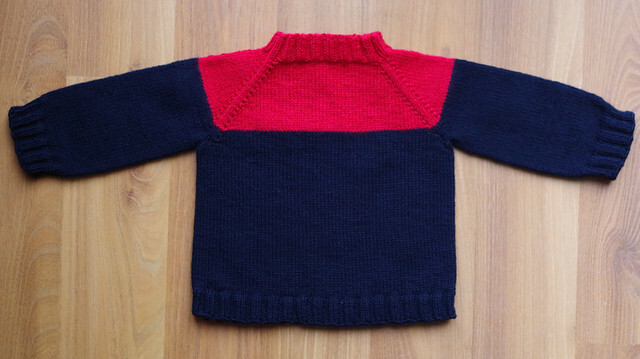 – Give the whole sweater a hand wash and a good wet blocking. 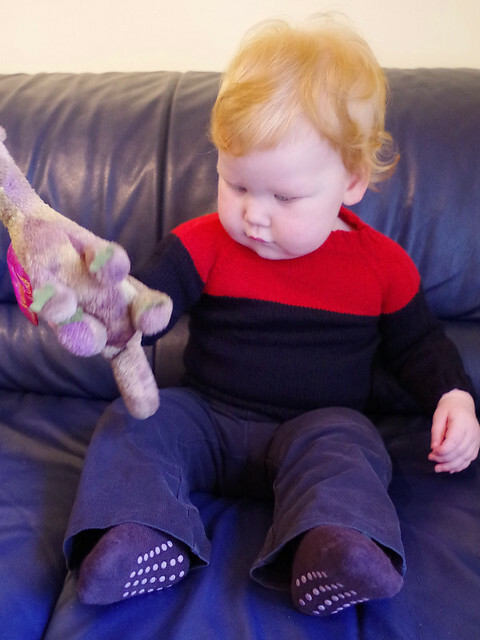 Posted on May 9, 2017 May 9, 2017 by owntwohandsblogPosted in Knitting, PatternsTagged baby, crafts, geek, gifts, Knitting, Patterns, star trek, sweater, television, toddler.